Full-HD mainstream. The Samsung Ativ Book 6 combines a powerful quad-core Intel Core i7 processor, 8GB of RAM and a dedicated AMD graphics card with a generous 15.6-inch Full-HD touch screen. How well the sleek-looking design performs and how it compares to its competitors is the subject of our review. 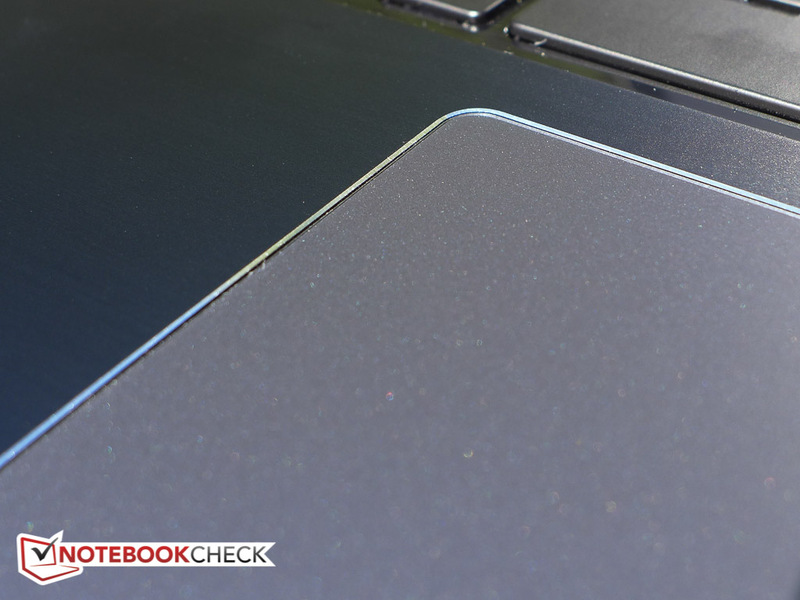 The notebooks in Samsung's Ativ Book series seems to cover the whole gamut of mobile computing. From the budget-priced Samsung ATIV Book 2 to the super-sleek and expensive Ativ Book 9 and with display sizes ranging from 13.3 to 17.3-inch, customers should be able to find a model to suit both their needs and budgets. While the previous-generation Series 6 was marketed towards business users - see our review of the Samsung Series 6 600B5C for details - the new Book 6 has gone decidedly mainstream. With its aluminum-clad body, potent previous-generation quad-core CPU and dedicated graphics card, the new notebook promises to handle tasks from simple word processing to moderate gaming with aplomb. The 15.6-inch touchscreen display sports a resolution of 1920 x 1080 pixels, which is a step above most lesser-priced competitors, many of which still have to make due with a paltry 1366 x 768 pixel resolution. At the time of writing, our review model can be found online for around $1100. How well does the rather pricey 15.6-inch notebook handle daily workloads? Overall construction is remarkably similar to another member of the series - the 13.3-inch Samsung Ativ Book 5, which fulfills Intel's Ultrabook specification. Of course, the 15.6-inch Ativ Book 6 is substantially larger at 375 x 250 x 23 mm (about 27 mm including the rubber feet) and also quite heavy at about 2.43 kg. 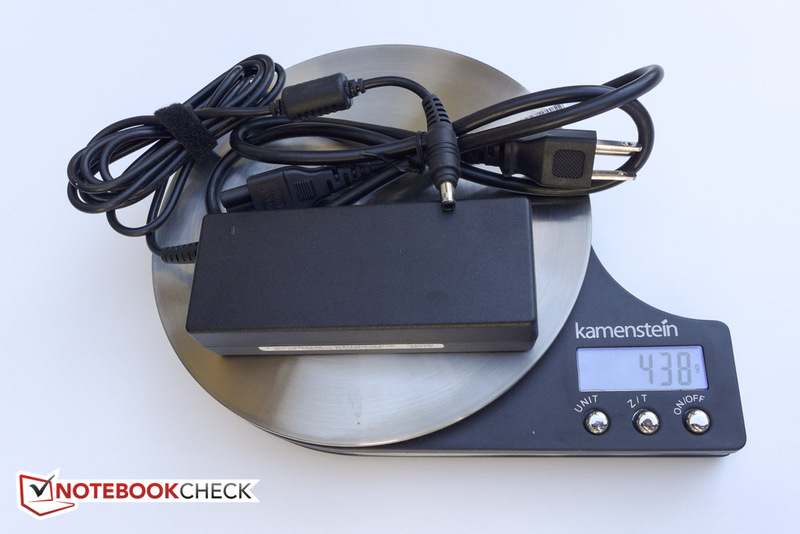 The good-sized power adapter adds another 440 grams. The 15.6-inch Sony Vaio SV-T1511M1E/S Ultrabook includes an optical drive and weighs about 2.23 kg. 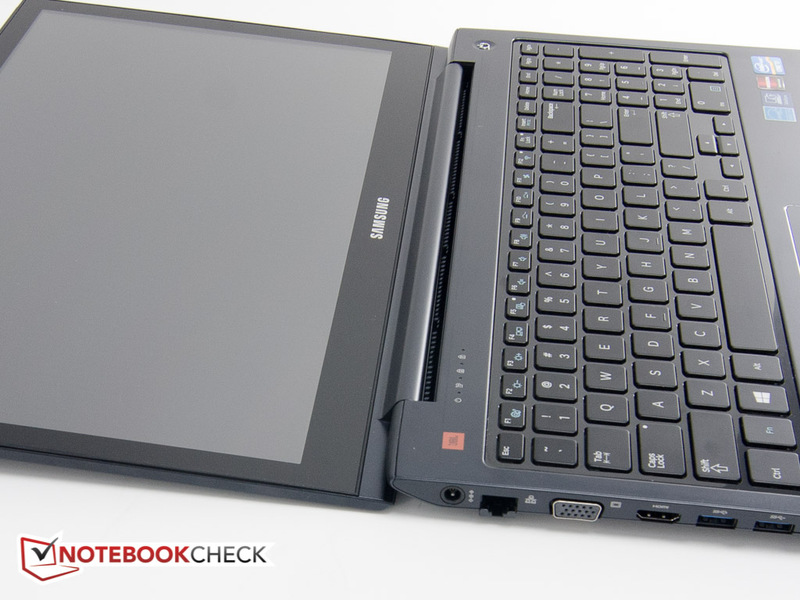 The Ativ Book 6 is still reasonably easy to carry, but we wouldn't want to lug it around on a daily basis. Appearance has been notably improved over the previous-generation Series 6 model and the new notebook is very stylish indeed. The textured display lid and the smooth top of the base unit are made from aluminum, while the bottom is made from fiber glass. 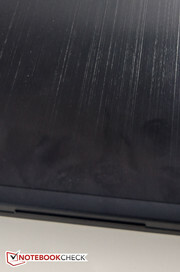 Samsung calls the finish "Mineral Ash Black", although it looks more blue to us than black, especially in natural light. 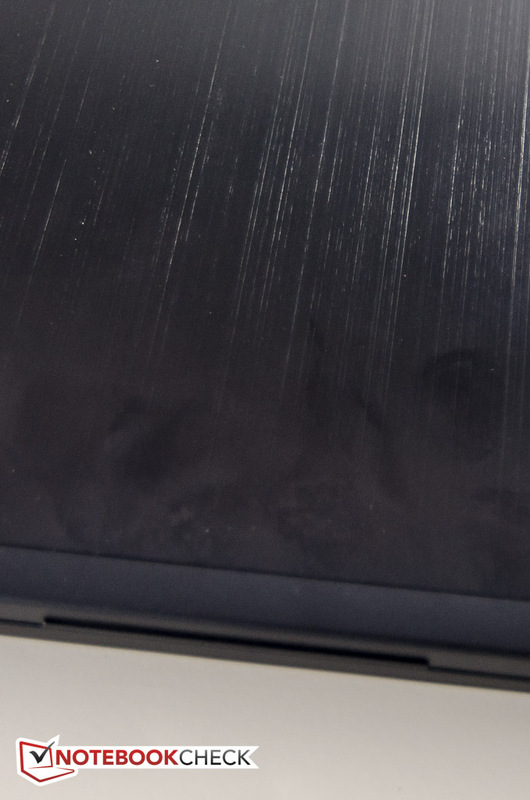 Unfortunately, the surface areas - especially the back of the display lid - are very prone to fingerprints, so users concerned with appearance need to keep a cleaning cloth handy. 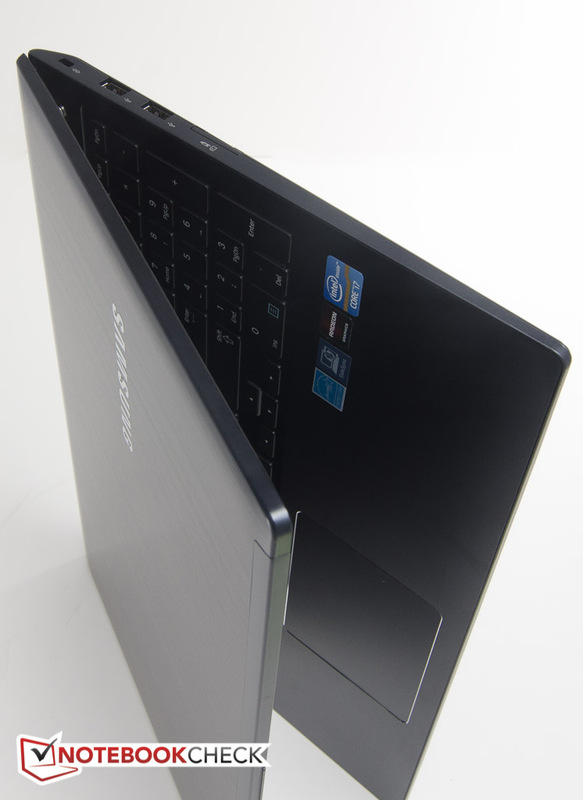 The touchscreen is not quite an edge-to-edge design, as a very small (about 1 mm) hard rubber strip surrounds it - presumably to prevent the screen from touching any part of the base unit when the notebook is closed. 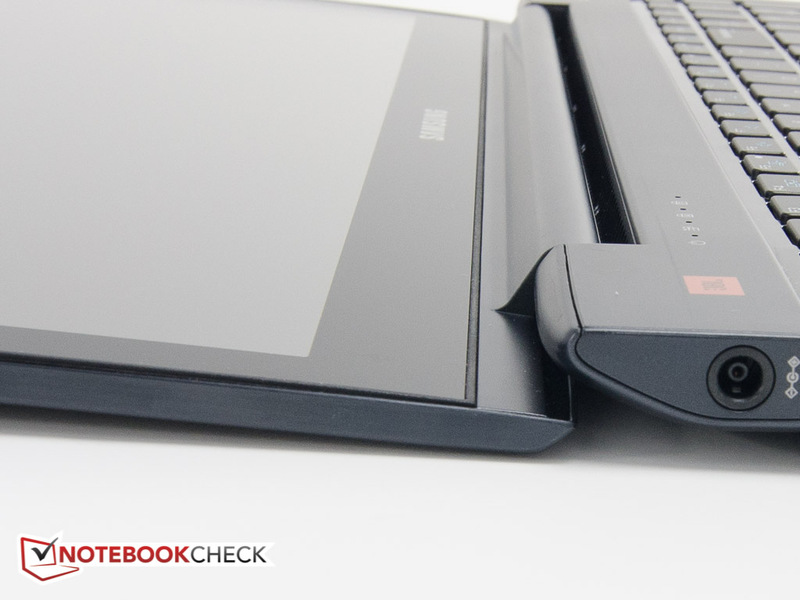 Thanks to the materials and sturdy construction, the notebook is remarkably resilient. The keyboard deck - a common weak spot on many notebooks - doesn't give very much when pressure is applied and the base unit in particular is torsionally very rigid for its size and thinness and doesn't creak when twisted. The quality of construction is good as well and the transition between the top part of the chassis and the bottom fiber glass cover is even and has no sharp edges. The hinges are not overly stiff and we observed some minor to moderate display bounce. ...both aluminum and fiber glass. The display tilts all the way back. 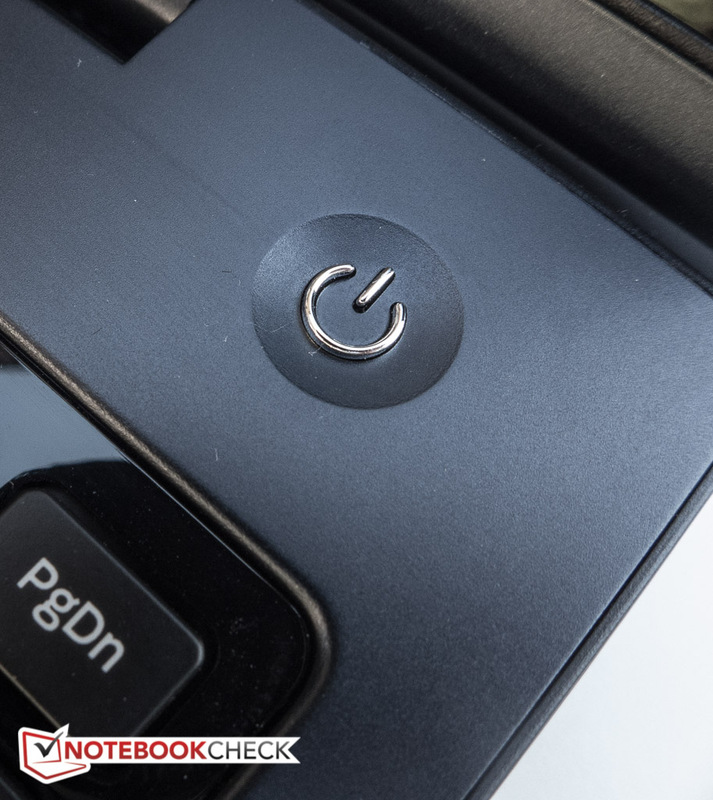 As a mainstream notebook, the Ativ Book 6 offers enough connections to satisfy most users, although the lack of an optical drive might be a significant drawback for those wanting to watch DVD movies on their notebook as well. 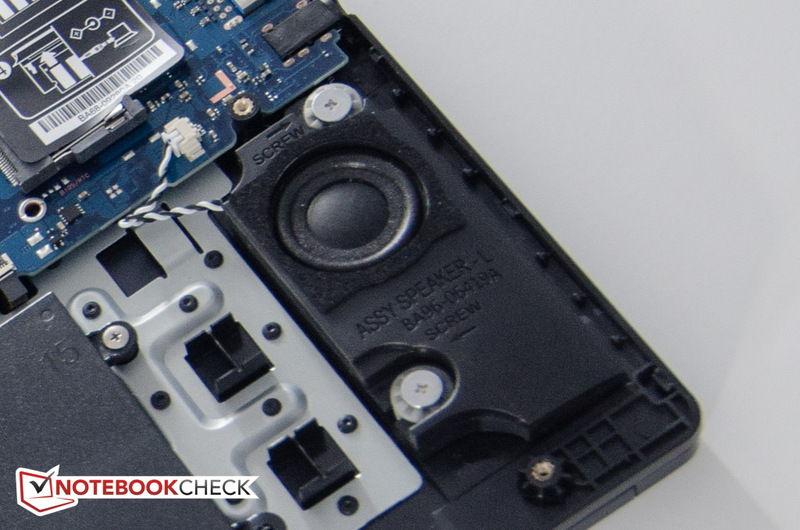 Since the Book 6 has a pretty decent footprint, Samsung was able to place all the ports where they ideally should be: towards the rear of the notebook. In fact, none of the ports are located in front of the keyboard deck, which ensures that USB devices and cables don't interfere with the operation of the notebook. Most of the ports - including the two video-outs and the two USB 3.0 ports - are located on the left-hand edge; the right side is pretty bare by comparison. 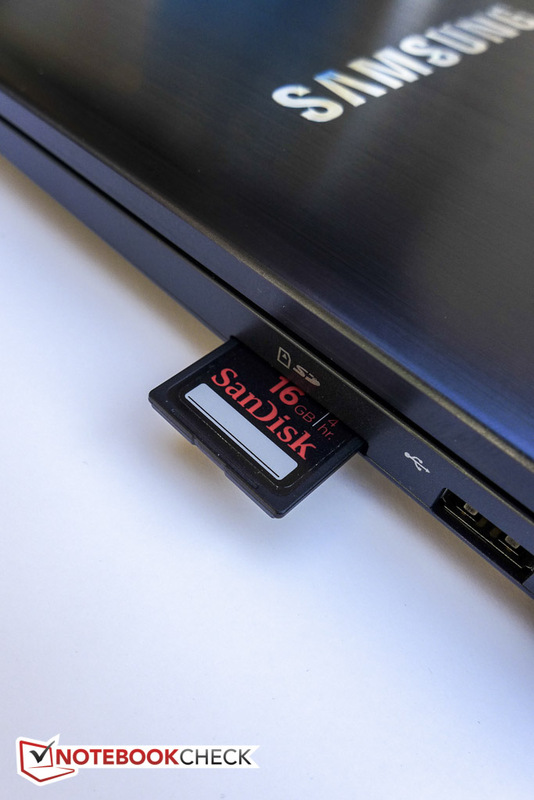 The card reader (SD, SDHC, and SDXC) doesn't allow the cards to be fully inserted, so care needs to be taken when handling the notebook with a SD card in place. 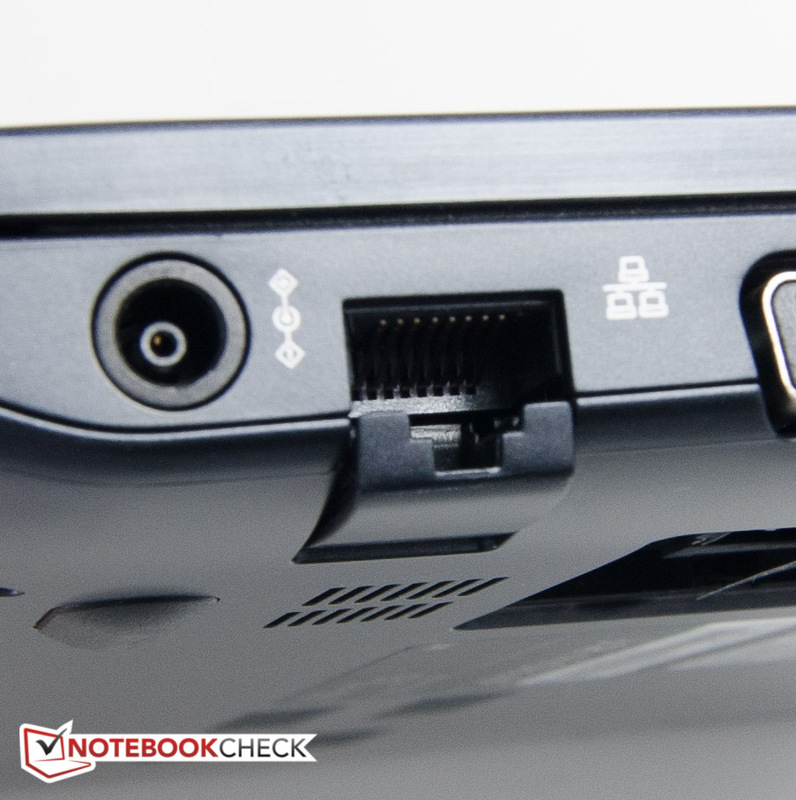 As far as the wireless connectivity is concerned, the Ativ Book 6 includes a dual-stream (2x2) Centrino Advanced-N 6235 PCIe Half Mini Card which also supports Bluetooth 4.0 and WiDi. 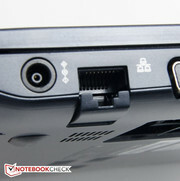 During our time with the notebook, we never had any issues with dropped connections or the signal strength. Wired connections are courtesy of a Realtek RTL8168/8111 module. Due to the thin design, Samsung opted for a drop-down connector cover, which works fine and doesn't seem flimsy at all. As it is common with Samsung notebooks, the shipping box is pretty empty and only includes the power adapter and some pamphlets in addition to the notebook. 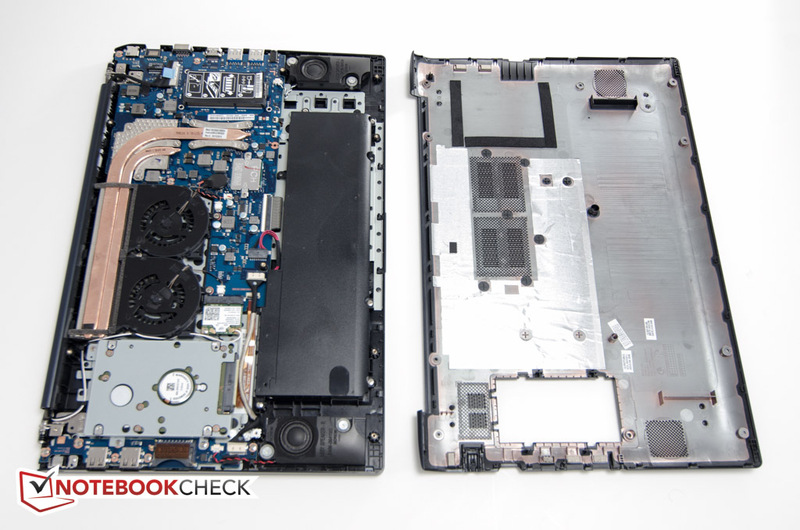 Samsung covers the Ativ Book 6 Touch Notebook with a 12 month standard parts and labor warranty. Upon registering, Samsung provides three additional months of warranty free of charge. 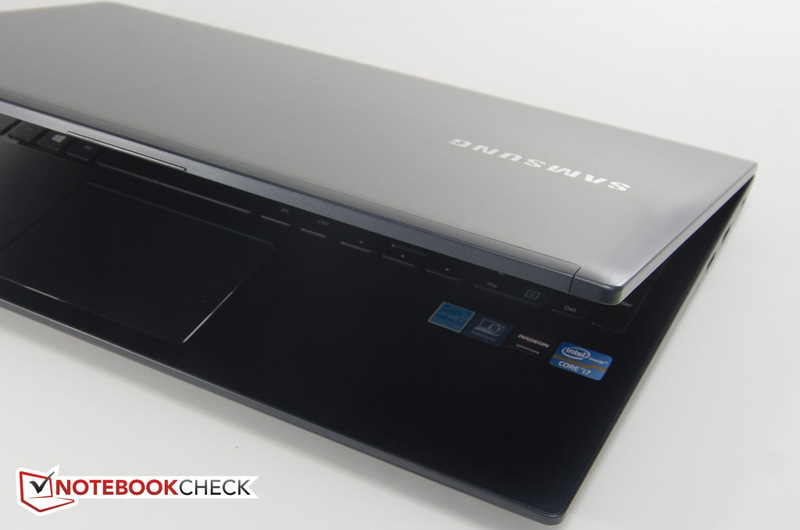 Samsung supplies the Book 6 with a chiclet-style keyboard, which sits - just like on the Ativ Book 5 - suspended in a glossy black plastic insert. On this much larger notebook, Samsung decided to incorporate a dedicated numeric keypad. The matte and flat keys have decent feedback considering the fairly moderate travel, but we couldn't quite get comfortable touch-typing. The layout takes some time getting used to: the right edge of the touchpad, for example, doesn't line up with the space bar as normally seen, but rather extends to the right Alt-key as well. This design feature caused us to move the cursor inadvertently with our right palm during typing sessions. As appropriate for the price range, the keyboard is backlit and features four brightness levels. The Elan touchpad (108 x 76 mm) worked well for the most part, although we experienced a few glitches and had to reboot the notebook on a few occasions to stop the erratic behavior of the cursor. 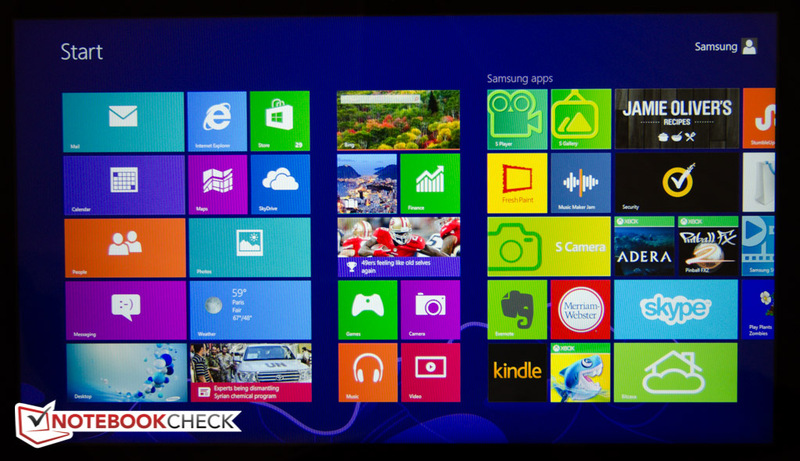 Multi-touch and Windows 8 swipe gestures - for example to call up the charms bar - are supported as well. The touchpad is recessed slightly and fingers glide easily across the smooth surface. As it's very common now, the touchpad doesn't come with individual mouse buttons, as the actual surface needs to be clicked instead. The feedback of the left and right clicks is very good and audible as well. A special control panel with many options lets the user adjust the behavior of the touchpad to his or her liking. The Ative Book 6 ships with a capacitive touchscreen. The display recognizes up to ten fingers reliably and without any perceivable lag. The generously sized touchpad is recessed slightly. 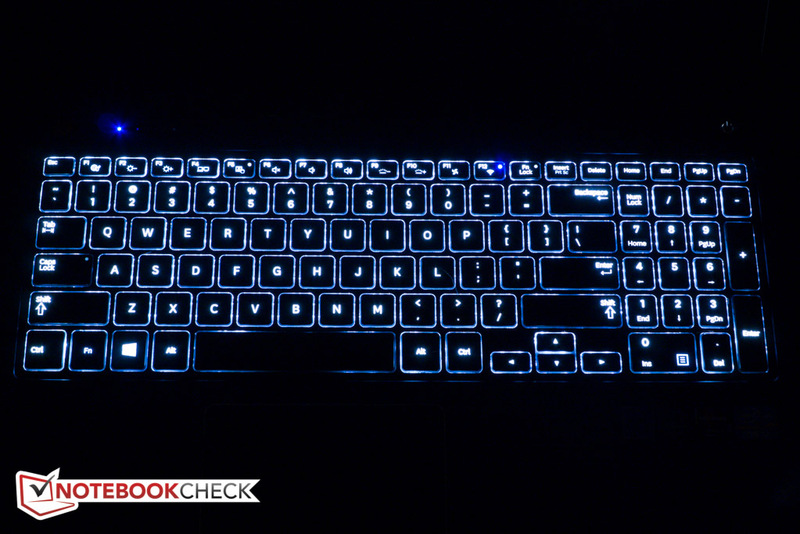 The keyboard backlight features four brightness levels. The Full-HD 1920 x 1080 pixel touchscreen panel is supplied by AU Optronics. Samsung has confirmed with us that the panel neither uses IPS nor PLS technology. The viewing angle stability, which we will get to a little later, suggest that this is a very high-quality TN panel. 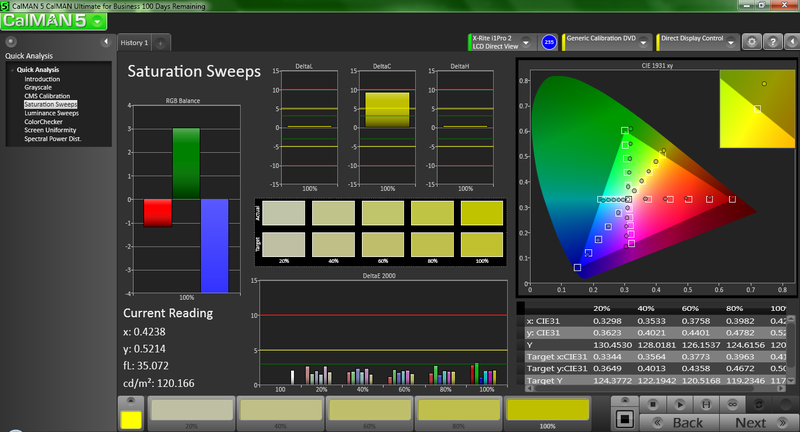 According to the X-Rite i1Basic Pro 2, the display is quite bright at about 240 nits. The Sony Vaio SV-T1511M1E/S Ultrabook is brighter still at 285 nits; the Lenovo IdeaPad S500 Touch, which only offers a HD resolution of 1366 x 768 pixels, literally pales by comparison and tops out at 170 cd/m². The brightness distribution of 85 % is decent, but not outstanding. 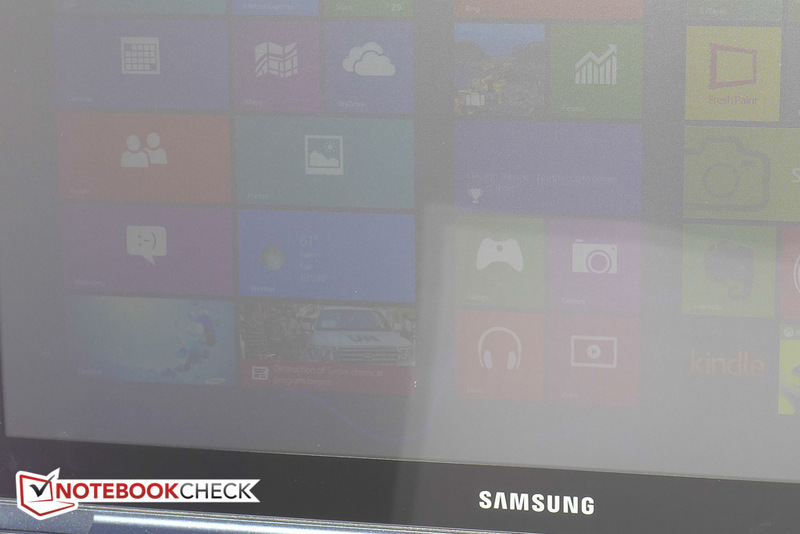 Even when running on battery, the screen of the Ativ Book 6 maintains its full brightness. Since the display panel looks distinctly gray when the notebook is turned off, one might expect that the black value would suffer accordingly - but nothing could be further from the truth. We measured an excellent 0.13 cd/m² and an outstanding contrast ratio of 1884:1. Blacks are truly black and not washed-out grays as often seen with budget panels. The display of the Sony Vaio Ultrabook has a contrast ratio of about 516:1 and even the premium HP Spectre XT TouchSmart only reaches about 800:1. The panel of the Ativ Book 6 covers the professional color spaces sRGB and AdobeRGB to about 81 % and 60 %, respectively - a very decent result. Budget notebooks usually struggle in this area: the Acer Aspire V5-571P-6499, for example, only covers a little over 60 % of the sRGB color space. 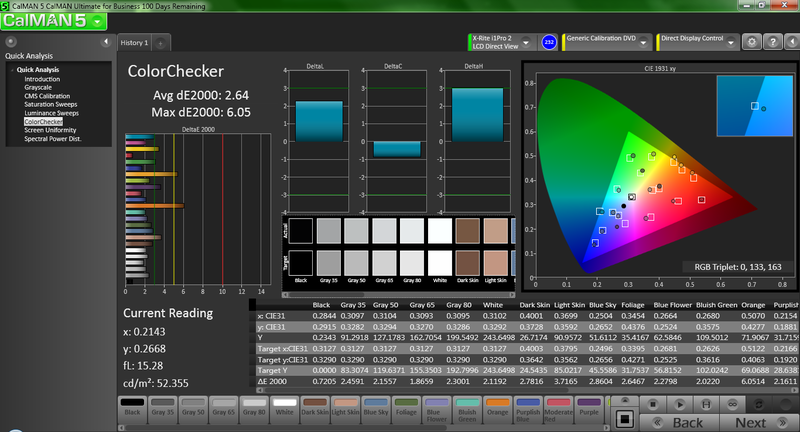 Color accuracy is quite astounding: we recorded an average DeltaE-deviation of only 2.64. The color temperature of about 6600K is also close to the ideal of 6500K, which means that this display is not plagued by the distinctly bluish cast normally associated with white-LED panel technology. Though not up to professional standards, the panel should be more than sufficient for home users wanting to edit their photos on the Ativ Book 6. Even though the display is quite bright, outdoor usability is unfortunately restricted as the screen is glossy and thus highly reflective. While we were able to decipher the screen content in the shade without major issues, thanks to the good brightness, direct sunlight makes working with the notebook outside almost impossible due to the substantial glare. 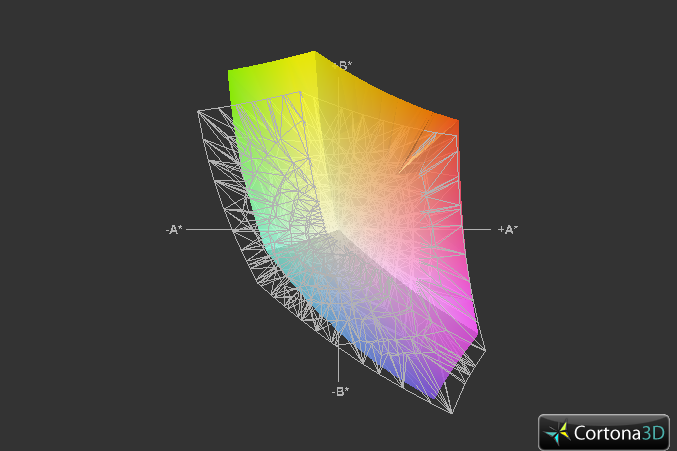 Viewing angle stability, on the other hand, is outstanding. Even moderate to severe deviations from the ideal vertical viewing position don't have a pronounced effect. 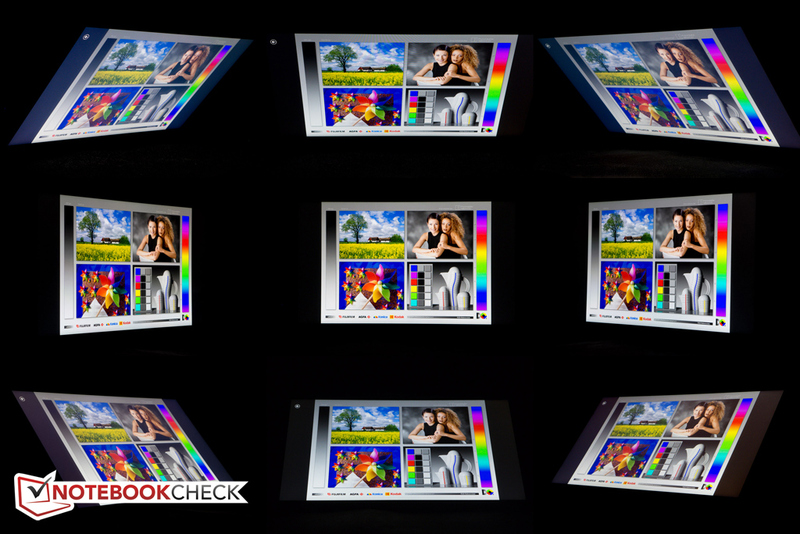 While the image might get a bit dimmer and lose some contrast, colors never invert or wash out completely. Even multiple users should thus not have any issues when viewing the screen at the same time. All things considered, this display panel is a clearly a step above the competition. 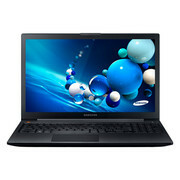 Just like the Ativ Book 8 Touch, which is equipped with the more powerful AMD Radeon HD 8870M graphics card, the Ativ Book 6 ships with an Intel Core i7-3635QM processor. Although this quad-core CPU is the sole processor option, its performance is very good and should please most users. 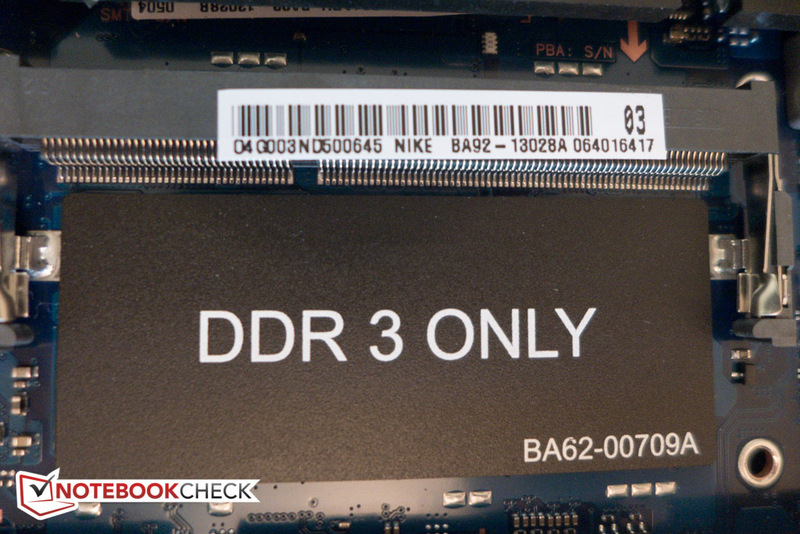 RAM is provided by a single 8 GB PC3-12800 DDR3 module, which is soldered onto the motherboard. One slot is open, however, so the notebook can be expanded to 16 GB total, which should be more than sufficient even for heavy multi-tasking workloads. For storage space, Samsung uses a Seagate Momentus 1000 GB conventional hard drive spinning at a rather sedate 5400 rpm. Samsung does list another version of the Ativ Book 6 on their website, which has 2x 4GB of RAM, thus allowing the RAM to operate in dual-channel mode. Otherwise the systems appear to be completely identical. The Intel Core i7-3635QM is an older quad-core model based on the Ivy Bridge architecture with a TDP of 45 watts. 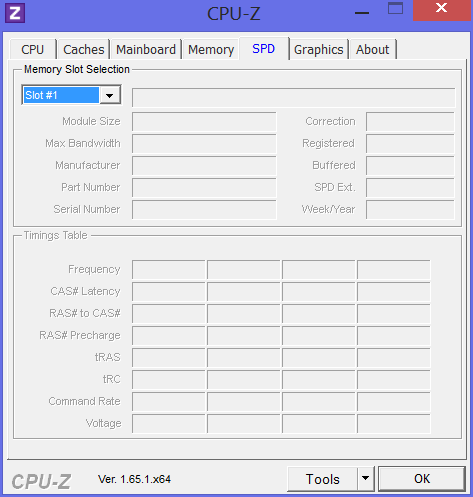 The CPU is clocked at 2.4 GHz nominal, but features a Turbo Mode, which can overclock all cores to 3.2 GHz, two cores to 3.3 GHz, and a single core to 3.4 GHz. 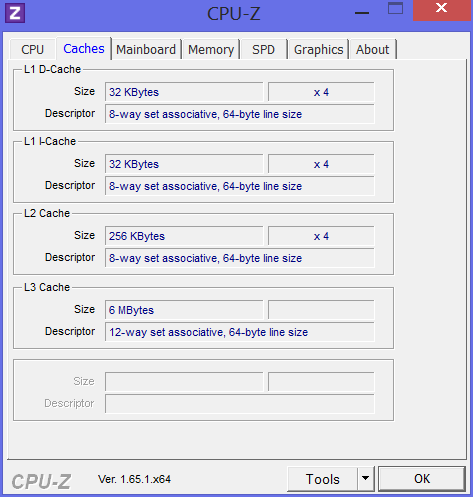 In the multi-core Cinebench R11.5 (64 Bit) benchmark test, the CPU scored 6.42 points. 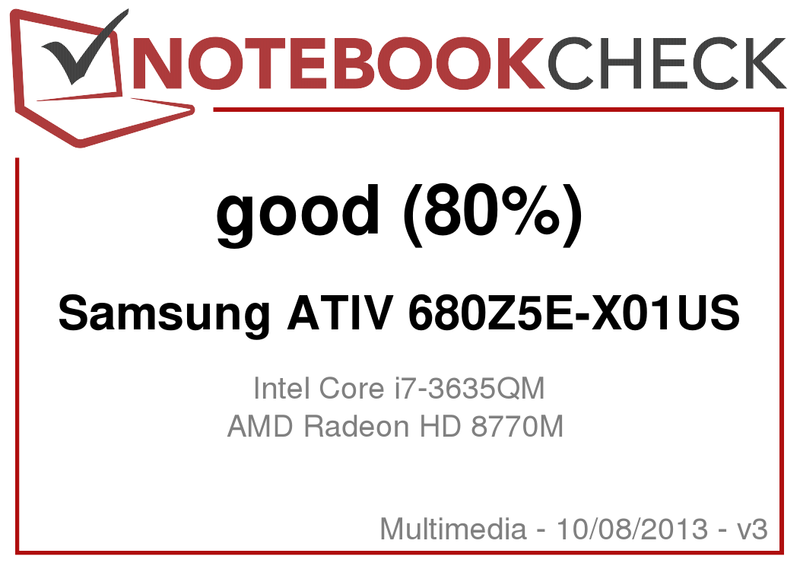 Not surprisingly, the Ativ Book 8 with the same processor scored an almost identical 6.46 points. The Sony Vaio SV-T1511M1E/S Ultrabook uses a much less powerful Intel Core i5-3337U ULV CPU and thus ends up with a significantly lower score of 2.38 points. The One K56-3F (Clevo W650SR), which comes with a newer quad-core 2.4 GHz Core i7-4700MQ Haswell processor, managed 6.96 points - a plus of only 8 %. 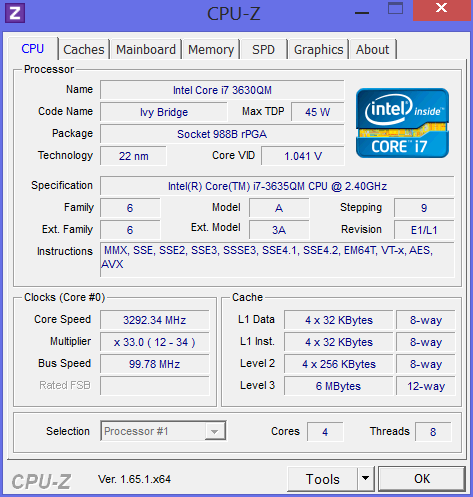 The single-core Cinebench R11.5 confirms that the new Haswell processors are not that much faster: while our review model completed the test with a score of 1.37 points, the Clevo ended up with 1.51 points - a difference of about 10 %. The difference in single-core performance between the ultra-low voltage i5 CPU (TDP 17 watts) and the i7 CPU (TDP 45 watts) is also quite noticeable - although not as pronounced as during the multi-core tests. 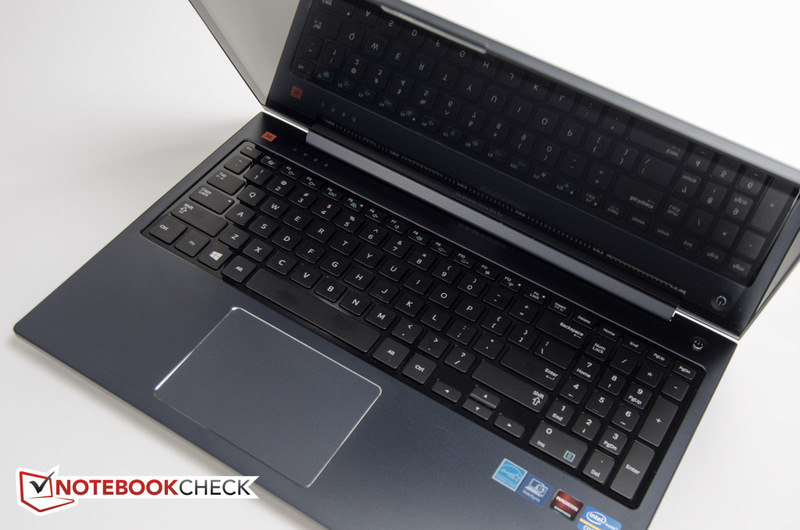 The Lenovo IdeaPad S500 Touch, which is also equipped with the dual-core Intel Core i5-3337U ULV CPU like the Sony Ultrabook, earned 4534 points during the CB10 Rendering Single 64-bit benchmark test, while the Ativ Book 6 scored 5877 points - a plus of about 30 %. 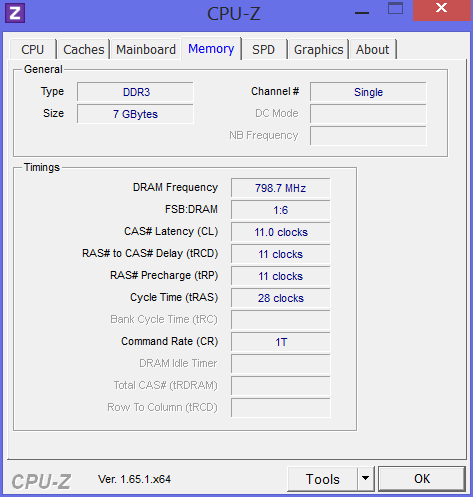 We use PCMark 7 to evaluate the overall system performance. With a score of 3300 points, the Ativ Book 6 falls behind both the Sony Vaio and the Lenovo Ideapad with 3492 and 3340 points, respectively. The storage sub-score reveals the reason: both competing systems mentioned above feature SSD cache, which significantly boosts their performance in this synthetic test despite the less powerful hardware. 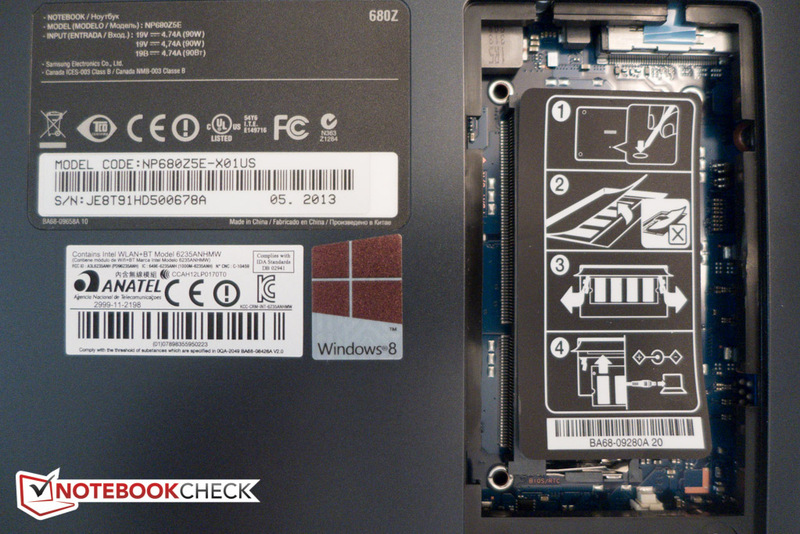 The Ativ Book 8 Touch also comes with a platter-based hard drive and scores a nearly identical 3290 points. Given the price point of the system, we would have expected Samsung to at least supply a SSD cache drive to supplement the hard drive. As is, launching programs feels subjectively very slow despite the "RAMaccelerator", which promises to "load applications 1.5x faster" if they have been previously opened. At least the performance is consistent even when the notebook is running on battery power. When we repeated a few benchmark tests, we were rewarded with nearly identical scores, which is good news for those users who demand full performance even when away from an outlet. The hard drive is a SATA II model. The notebook uses a conventional platter-based hard drive from Seagate - a Momentus ST1000LM024 HN-M101MBB. According to HD Tune, the 1 TB, 5400 RPM model transfers data at 82.4 MB/s on average, which is respectable for this type of drive, but far from great. 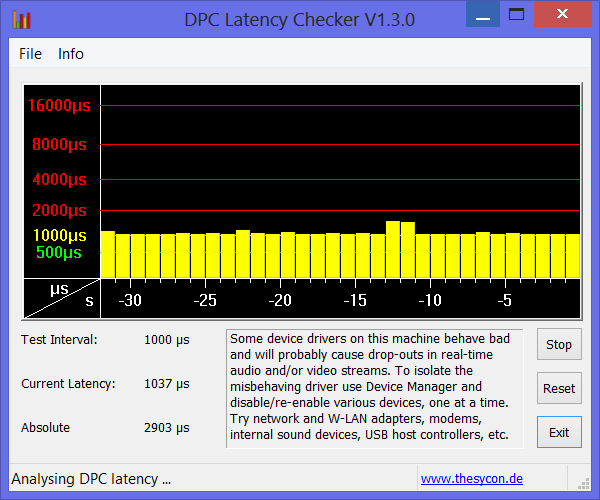 The access time of 19.4 ms is also fairly slow. 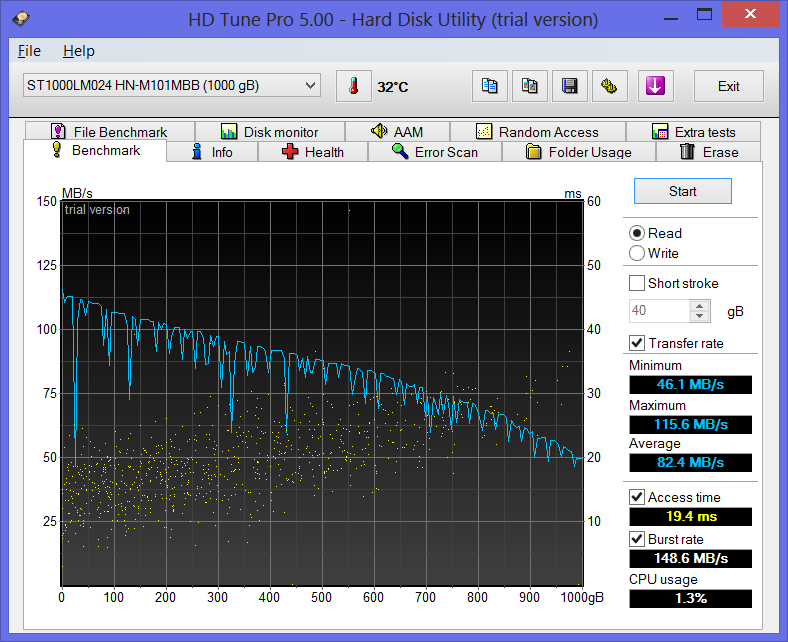 The cache-assisted hard drives in the Sony Vaio SV-T1511M1E/S Ultrabook and the Lenovo IdeaPad S500 Touch don't show better results in HDTune, although overall system performance increases due to way a hybrid drive operates. A good example for the performance offered by a SSD is the One K56-3F, which comes with a 128 GB mSATA SSD and read and write speeds of 501 MB/s and 462 MB/s, respectively, as well as access times which are fractions of a millisecond. 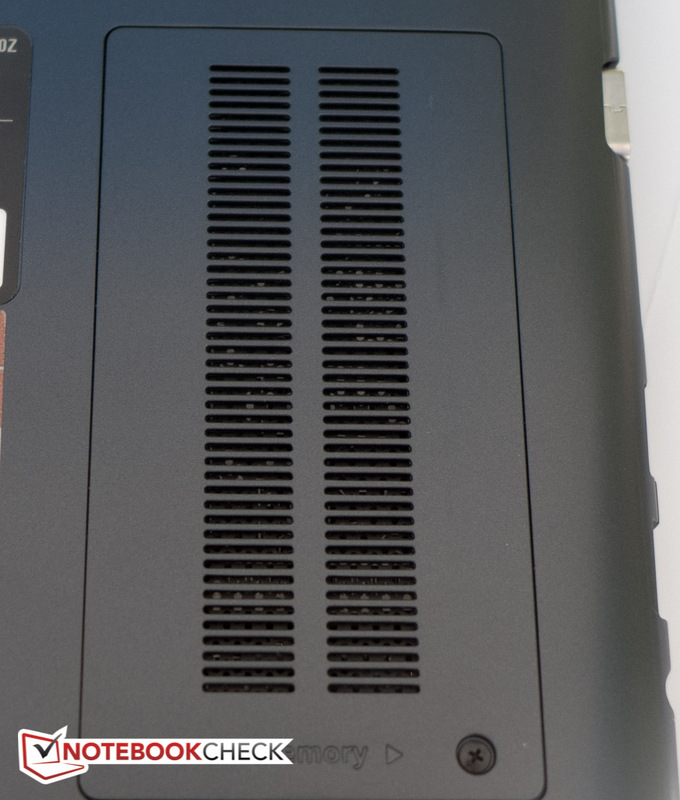 The Ativ Book 6 comes with an integrated Intel HD 4000 as well as a discrete AMD Radeon HD 8770M. The 28nm middle-class GPU is based on the Mars chip and comes with 384 shader cores and 1024 MB of GDDR5 VRAM. 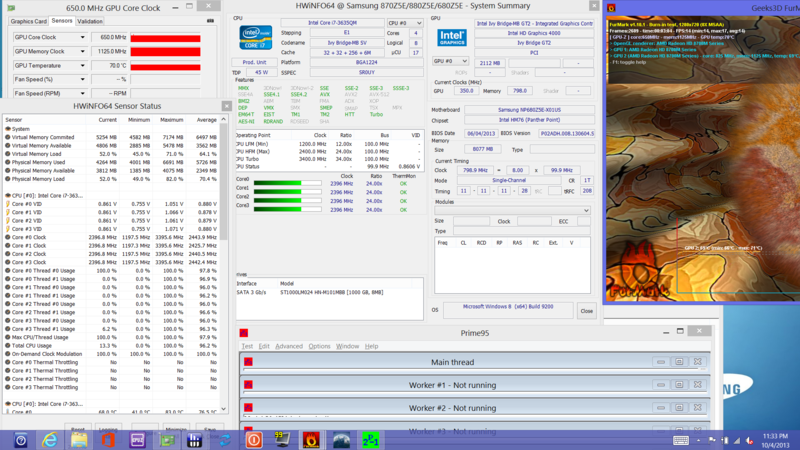 The core is clocked at 775 MHz, the memory at 1125 MHz. Similar to Nvidia's Optimus, AMD's technology also supports automatic graphics switching between the integrated and the dedicated GPU. The Radeon 8770M ran the Unigine Heaven 2.1 benchmark at 26 fps, which is close to the performance of Nvidia's GT650M in the Clevo W150ER, which achieved 27.6 fps (about 6 % faster). 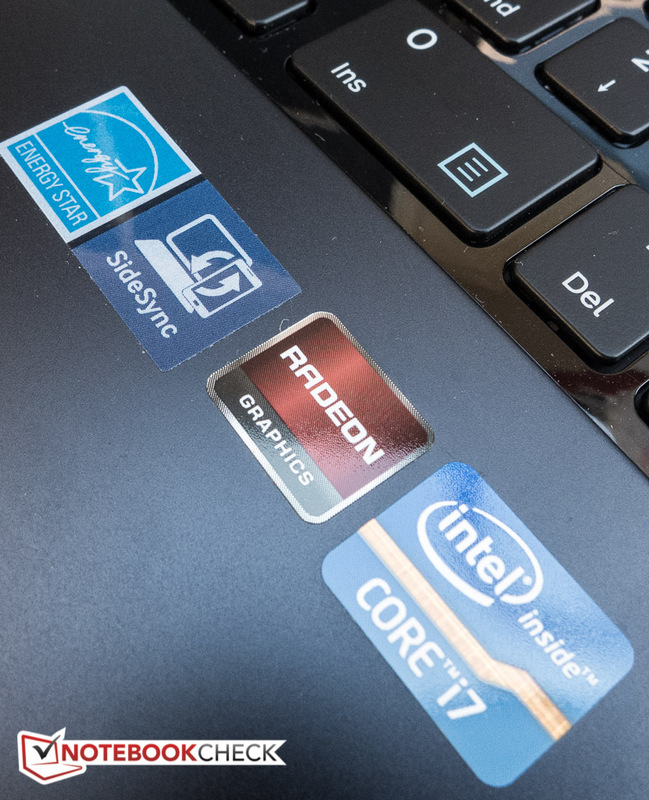 The 3DMark 11 benchmark test paints a similar picture, although the GT650M in the Clevo trails our review notebook by a little over 1 % this time (2178 compared to 2206 points). The Lenovo IdeaPad S500 Touch with the lower-end GeForce GT 720M only scored 1070 points; the Samsung Ativ Book 8 with its significantly more powerful Radeon HD 8870M was able to take the lead with 3252 points. We were not able to run the 3DMark 13 benchmark, as test repeatedly failed with the following error: "Unexpected error running tests. Workload failed with error message: Process exited unexpectedly". 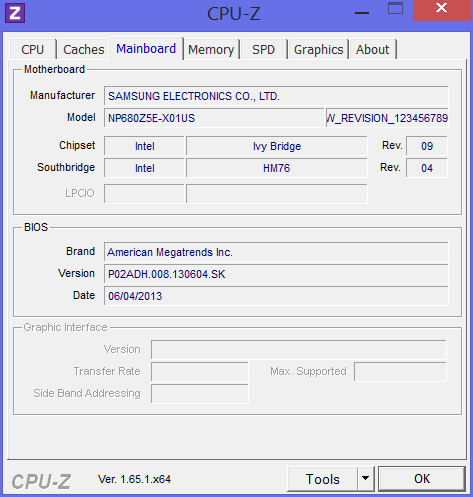 Maybe a GPU driver update (installed is version 9.3.5.0) or a Bios update (currently P02ADH) would fix the issue. 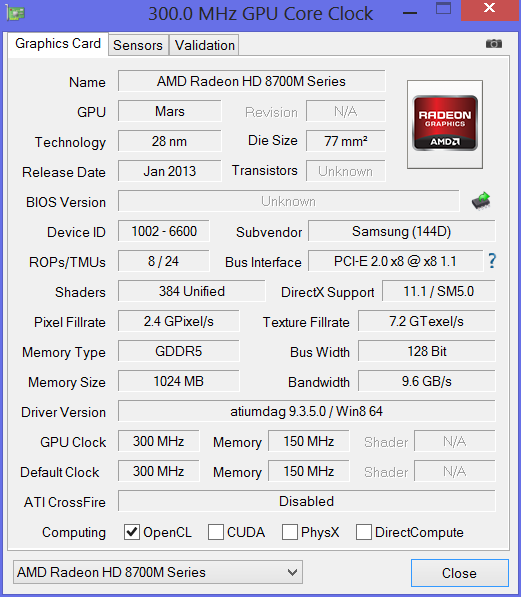 The Radeon 8770M runs less demanding games like FIFA 13 at very high frame rates even at maximum details. GPU-intensive games will require the user to either lower the resolution or reduce the details to avoid stutters. Anno 2070, for example, dropped to 15.7 fps at a resolution of 1920 x 1080 pixels with details set to high. 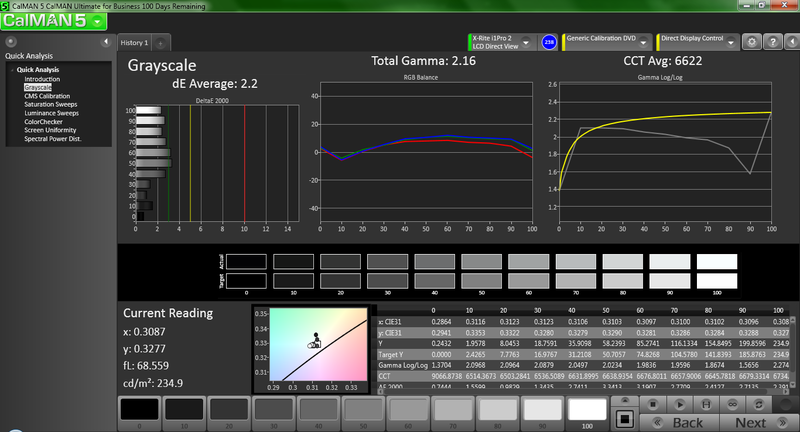 The GT650M in the Clevo W150ER performs a little bit better here at 17.7 fps. 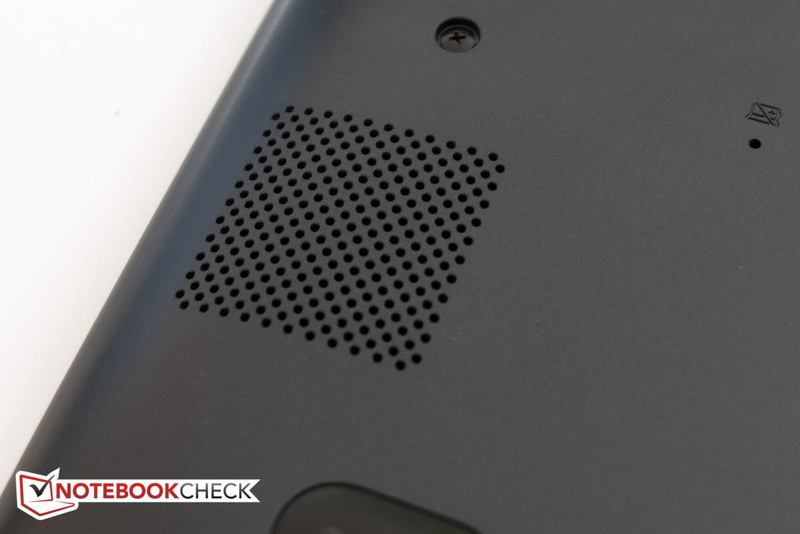 The Ativ Book 6 is reasonably quiet, although audible even during idle - we measured about 33 dB. The fan noise is pretty unobtrusive and doesn't become bothersome even after extended periods of time. The Sony Ultrabook, which does not have a dedicated GPU, was even more quiet at 31 dB. When subjected to maximum load (stress test - Prime95 and Furmark running), the noise level increased to a pretty bothersome 45 dB. Since this is a slim design with a dedicated graphics card, it's not surprising that the dual-fan cooling system needs to work a bit harder to keep the chassis cool. Of course, situations like the one mentioned above are unlikely to happen during normal usage scenarios. 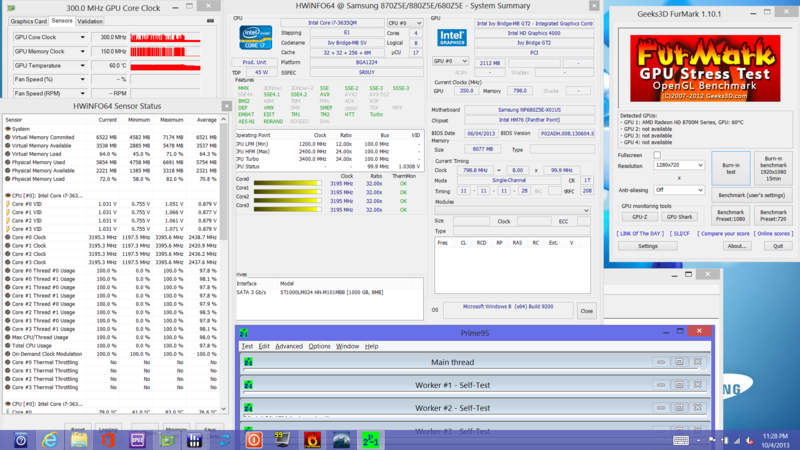 Interestingly enough, the more powerful Ativ Book 8, which is also equipped with dual fans, topped out at only 41 dB. We recorded idle temperatures of about 30 degrees Celsius on both the top and the bottom of the notebook. The right bottom edge towards the display gets a little warmer at 35 degrees Celsius, although there is no reason for concern. Temperatures under load are higher of course - particularly the keyboard area, which now reaches about 41 degrees Celsius in the middle. The all-important palm rest, however, stays below 30 degrees Celsius at all times. The hot spot on the bottom of about 40 degrees Celsius is also in the middle towards the back, so placing the notebook on the lap is possible without feeling any discomfort. (±) The average temperature for the upper side under maximal load is 35.1 °C / 95 F, compared to the average of 30.9 °C / 88 F for the devices in the class Multimedia. (+) In idle usage, the average temperature for the upper side is 30.4 °C / 87 F, compared to the device average of 30.9 °C / 88 F.
To simulate a high-stress situation and to check for throttling issues, we use Prime95 and FurMark in parallel together with various monitoring tools. When we stressed the CPU only using Prime95, all four cores operated at the maximum Turbo Boost frequency of 3.2 GHz and stayed there for the remainder of the test. The CPU maxed out at very reasonable 79 degrees Celsius. During the GPU stress test with Furmark, the GPU quickly dropped to 650 Mhz at a temperature of 70 degrees Celsius. With both Prime95 and FurMark active, the CPU cores remained at their nominal 2.4 GHz, while the GPU frequency fluctuated between 450 and 650 Mhz. A quick check after two hours showed a GPU temperature of 71 degrees Celsius, while the CPU had maxed out at 83 degrees Celsius. When we repeated various benchmarks immediately after the stress test, we saw no discernible differences in performance between the notebook's pre-stress and post-stress conditions. Despite that fact that the JBL stereo speakers (2W x 2) are located underneath the notebook and fire downwards, the Ativ Book 6 is capable of an impressive range with very good bass and well-balanced mids and highs. The speakers also don't sound distorted even at higher volume levels, although external speakers are still recommended for those demanding the highest sound quality. Nonetheless - the speakers are very usable and not just an emergency solution. 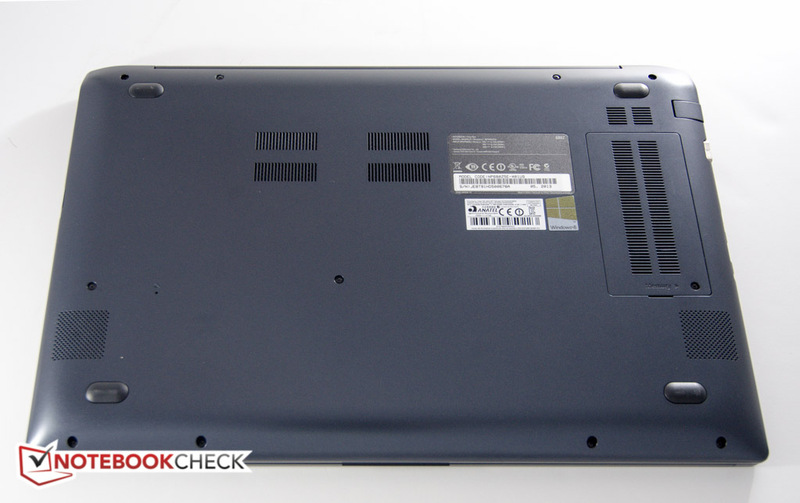 The Ativ Book 6 ships with a 57 Wh lithium-ion battery with a capacity of 3780 mAh. The battery is attached with screws and not glued in, as frequently seen. Samsung promises up to 4.7 hours on a charge. To simulate the maximum battery life, we utilize the BatteryEater Reader's test. We choose the minimum display brightness setting and disable the wireless radios. Under these conditions, the notebook lasted for 4 hours and 41 minutes. For our WLAN test, which we perform with the display set to 150 cd/m2 (7/10) and the Balanced Profile enabled, we recorded a battery run time of 3 hours. During this test, an automated script visits various websites in a 40-second interval. The Lenovo S500 Touch ran for 10 minutes longer. The Ativ Book 8, which has a much larger 91 Wh battery, lasted for a superior 6 hours and 26 minutes before the battery was depleted. The Sony Vaio only comes with a 43 Wh battery but was able to last close to 4 hours due to the more frugal hardware components. To establish the minimum battery life, we use the Performance Profile at maximum brightness and make sure that the dedicated GPU is activated. With the BatteryEater Classic Test running, the notebook shut down after a little less than 1 hour. Overall runtimes are far from impressive. 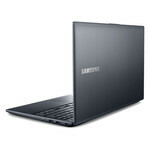 Many other 15.6-inch notebooks - including Samsung's own Ativ Book 8 - feature a longer battery life. Given the fact that the battery is just not very large and the CPU is a power-hungry non-ULV model, the results are not completely unexpected. We do appreciate that the performance doesn't take a hit while running the notebook on battery power. 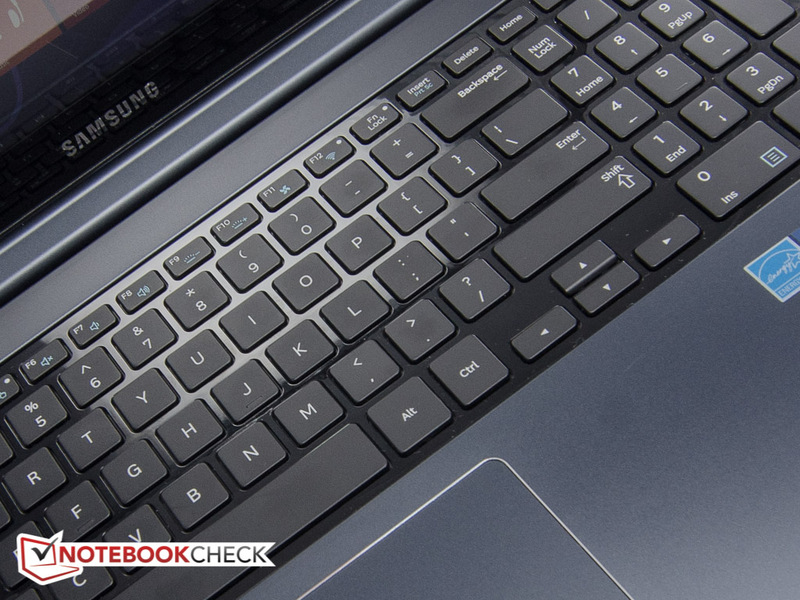 The 15.6-inch Samsung Ativ Book 6 is a mainstream notebook designed to address the needs of a broad user base. The build quality is high and the aluminum and fiber glass design is sturdy, sleek, and visually appealing. Too bad there wasn't enough room for Samsung to include an optical drive. The backlit keyboard with dedicated numeric keypad feels a little cramped and takes some getting used to. The touchpad is large and sensitive, but can be finicky at times. 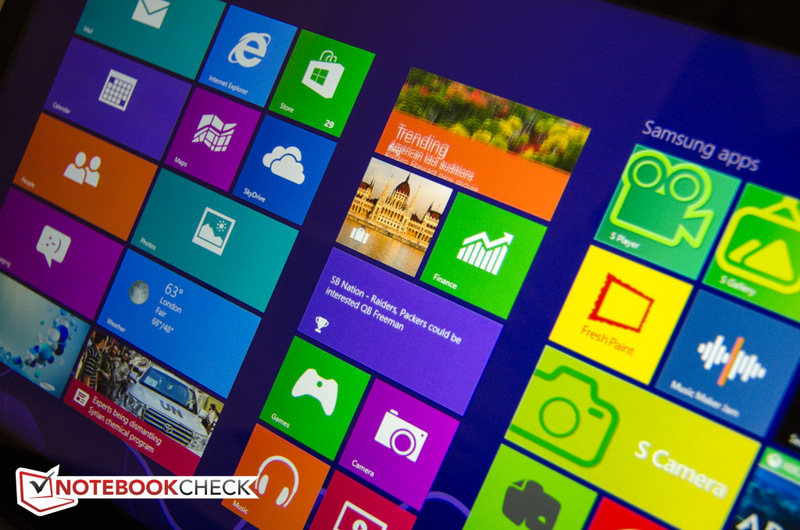 The glossy touchscreen is decently bright and features a Full-HD resolution of 1920 x 1080 pixels. Both color accuracy and viewing angle stability are much better than expected. Performance - thanks to the powerful quad-core CPU and dedicated graphics card - is very good, although the conventional hard drive is definitely a bottleneck. Launching applications require a little bit of patience, especially if the user will be coming from a SSD-driven system. 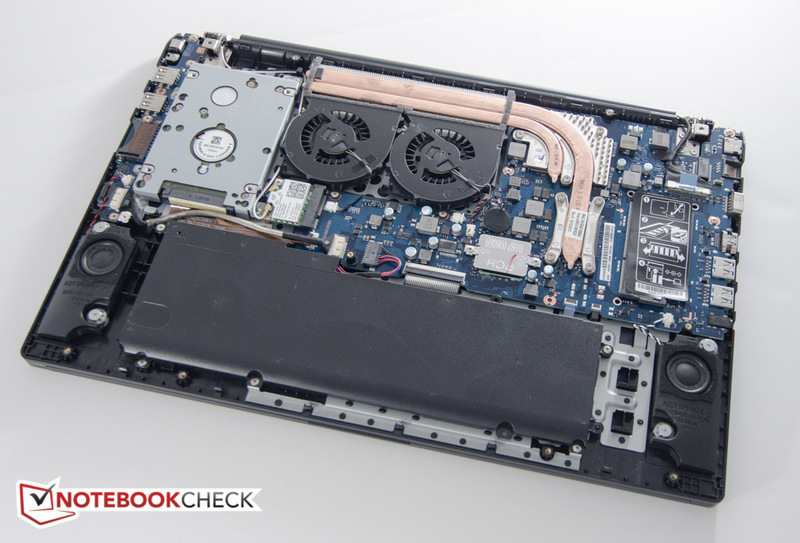 Once up and running, however, the Ativ Book 6 can handle almost any task thrown at it - and the dedicated Radeon 8770M is even sufficient for the occasional gaming session. The Samsung Ativ Book 6 is a sleek combination of aluminum and fiber glass. 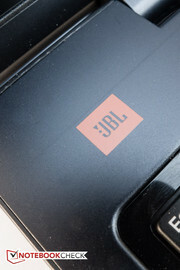 A thin strip of rubber protects the display panel. A resolution of 1920 x 1080 pixels maximizes screen real estate. The fiber glass bottom cover. ...gives access to the RAM. ...allows the display to tilt all the way back. 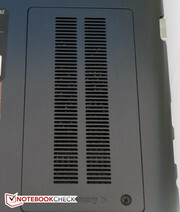 The fan exhaust sits between the screen and the base unit. The RJ-45 cover folds down. The SD card reader and 2x USB 2.0. Careful: SD cards sticks out rather far. The removal of the bottom cover requires patience. 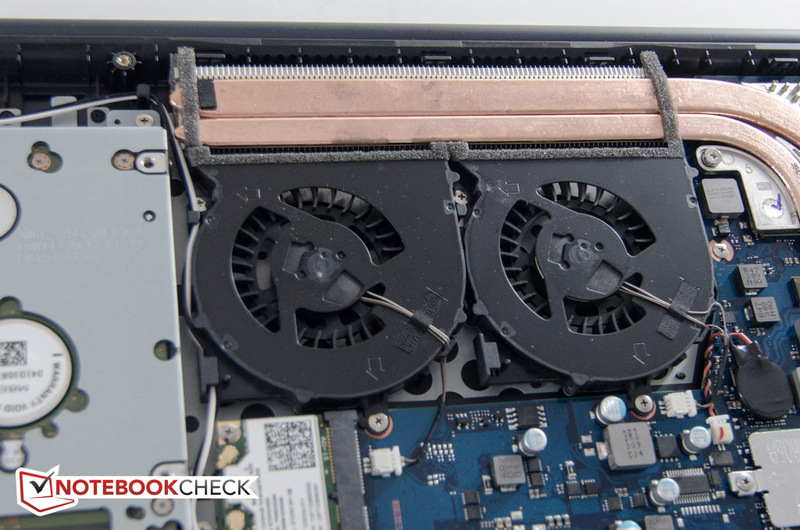 Dual cooling fans keep temperatures in check. The battery is screwed and not glued in, as frequently seen. One of the speaker grills on the bottom. The color accuracy and viewing angle stability of the Full-HD touchscreen. 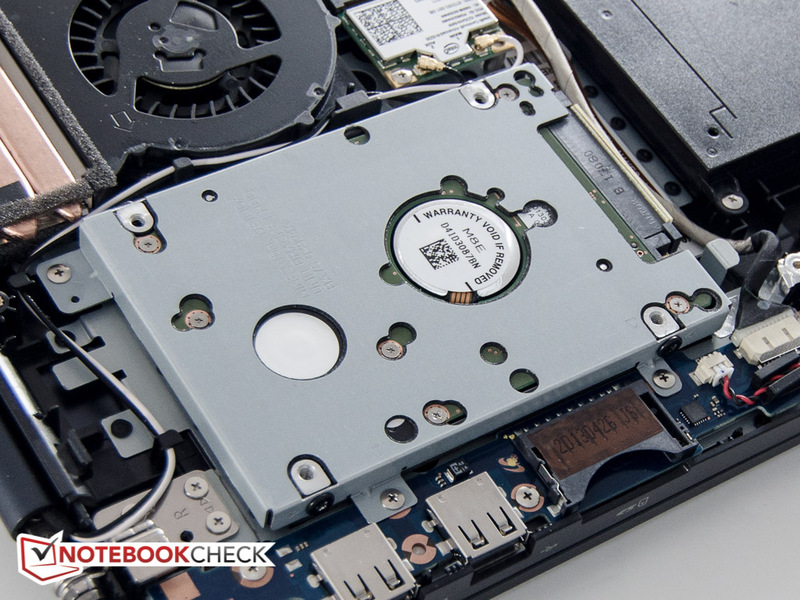 A faster hard drive - hybrid or SSD - would be on top of our list. That Samsung equips the Ativ Book 6 with a powerful CPU and a dedicated GPU, but prevents top-notch performance by using sluggish hard drive. Lenovo IdeaPad S500 Touch, Sony Vaio SV-T1511M1E/S Ultrabook, Acer Aspire V5-571P-6499, Ativ Book 8 Touch.